Under the current rules for those born after 5 April 1938 the personal allowance is currently £10,600, whilst those born before 6 April 1938 have a slightly higher allowance (read more about personal allowances by age below). In 2016/17, the personal allowance will increase to £11,000. The basic rate of income tax currently stands at 20%. The band of income taxable at this rate is £31,785, meaning that the threshold at which the 40% band applies is £42,385 for those who are entitled to the full basic personal allowance. Legislation has already been enacted to increase the basic rate limit to £32,000 for 2016/17. The higher rate threshold will therefore rise to £43,000 in 2016/17 for those entitled to the full personal allowance. The additional rate of income tax of 45% remains payable on taxable income above £150,000. The table below highlights the changes from the 2015/16 personal allowances and tax bands. *Only applicable to savings income. The rate is not available if taxable non-savings income exceeds £5,000. For 2016/17, £1,000 of savings income for basic rate taxpayers (£500 for higher rate) may be tax free. ** Except dividends 7.5% (0%). ♦ Except dividends 32.5% (25%). † Except dividends 38.1% (30.6%). Other income taxed first, then savings income and finally dividends. For 2016/17 the first £5,000 of dividends are tax free (although they will still count as income towards your basic rate or higher rate bands). As mentioned above, under the current rules for those born after 5 April 1938 the personal allowance is currently £10,600, whilst those born before 6 April 1938 have a slightly higher allowance. However, from 2016/17 onwards, only one personal allowance will now apply, regardless of age and date of birth. It is still important to note that not everyone has (or will have) the benefit of the full personal allowance. There is a reduction in the personal allowance for those with ‘adjusted net income’ over £100,000 which is £1 for every £2 of income above £100,000. So for 2015/16 there is no personal allowance where adjusted net income exceeds £121,200 (£122,000 for 2016/17). The Chancellor has already announced that the personal allowance will be increased to £11,500 and the basic rate limit increased to £33,500 for 2017/18. The higher rate threshold will therefore rise to £45,000 for those entitled to the full personal allowance. 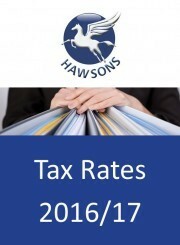 Many of the tax rates and allowances are fundamental to our business and personal lives and the main ones for the 2016/17 tax year can be found on our website, by clicking here. You can find all of our latest tax articles and tax resources here. Jenny Brown is a personal tax manager at Hawsons, based in the Sheffield office, who manages the personal tax affairs of our clients. She started her career with HM Revenue and Customs, specialising in small business compliance. For more details and advice, please contact Jenny on [email protected] or 0114 266 7141 or your local tax specialist.